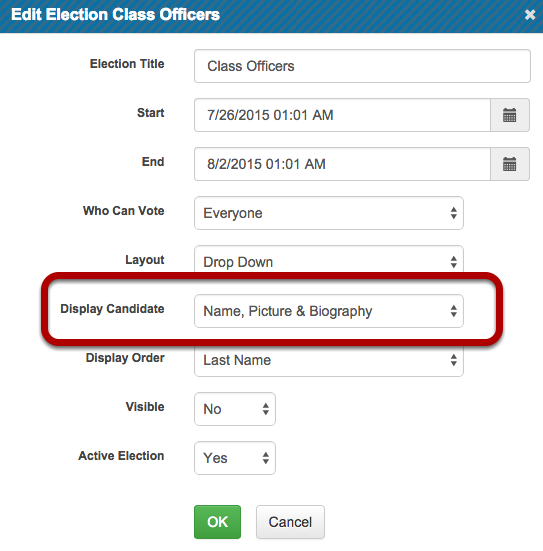 When setting up an election you have the ability to show a candidate picture and up-to two text boxes. We call box number one Biography and box number two Hobbies. The titles of these sections and what you text you enter in the box is customizable. To use the text boxes when setting up or editing an election, choose one Display Candidate options that includes Biography. Click the Settings icon to access System Settings. Click Candiate Description #1 or #2 to change the label that students will see. For example you might want it change the title to Description instead of Biography. When a student votes, you will see the title in the election. Click here to see how to edit a candidates biography. If you dont want to show one of the sections, just leave the title blank.